I’ve been looking at doing some wild camping for a while now to allow me to access some more off the beaten track areas. 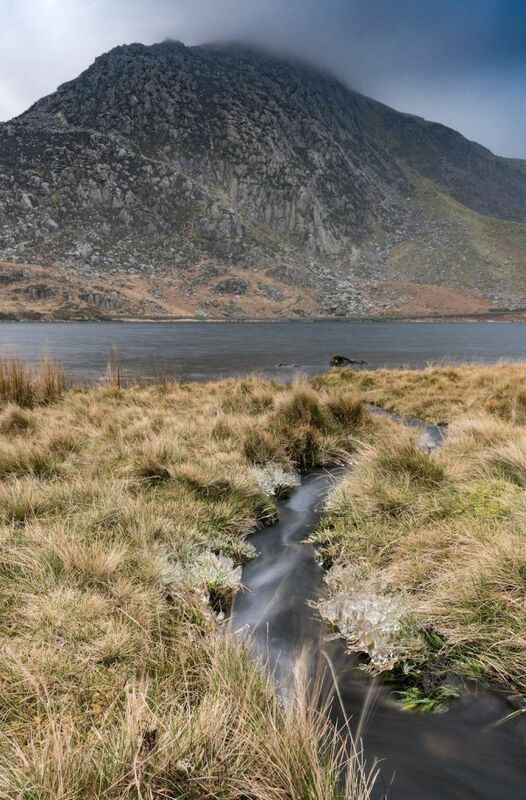 I’ve been a big fan of Alex Nail’s time-lapse and photography work for a while now, and when I saw he was running a very reasonably priced photography workshop in Snowdonia with a wild camp thrown in, booking was a no brainer! So that’s how I found myself driving to northern Wales on a very sunny Saturday morning. 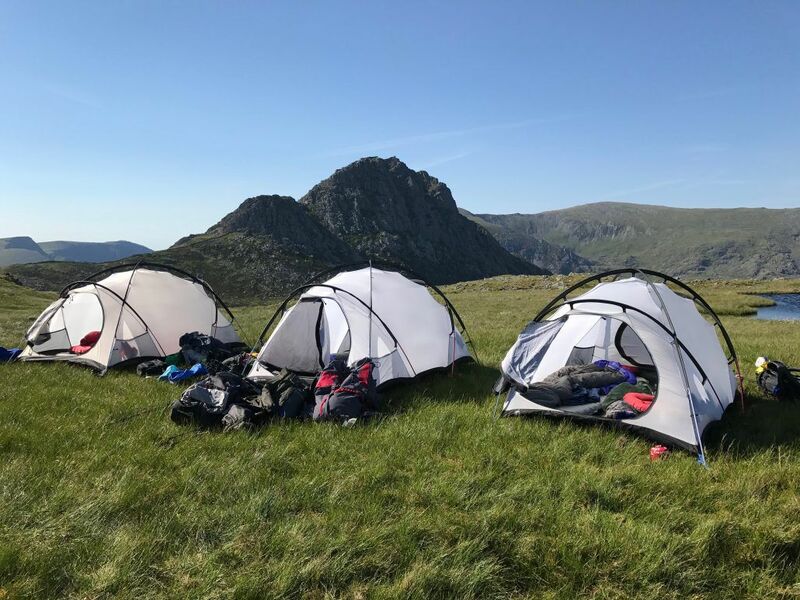 Around 11am, I arrived at the pre-arranged meeting point on the A5 in the shadow of Tryfan; there is a lot of parking available in and around this area, but it seems that so many people were taking advantage of the fine weather that it still proved difficult to find a spot. The weather was a far cry from the wet, windy and bitterly cold February morning that I was last in the area. A short mooch back down the A5 found Alex and a couple of the other group members – Alistair and Ryan, who had travelled over from Northern Ireland the previous night and experienced a rather stressful journey. We all enjoyed the craic as we waited for the two remaining members of the group to arrive. This happened within a short space of time, with both Jonathan and Hannes finding it easier to park than I did. One of the attractions for me of booking on Alex’s wild camp workshops is that he supplies the majority of the camping gear, in this case tents, sleeping bags and mats, and stoves. This addressed one of the nagging doubts in my mind about starting to wild camp – had I chosen kit that would be up to the task? This kit was divvied up between the members to transport up to the camp site. 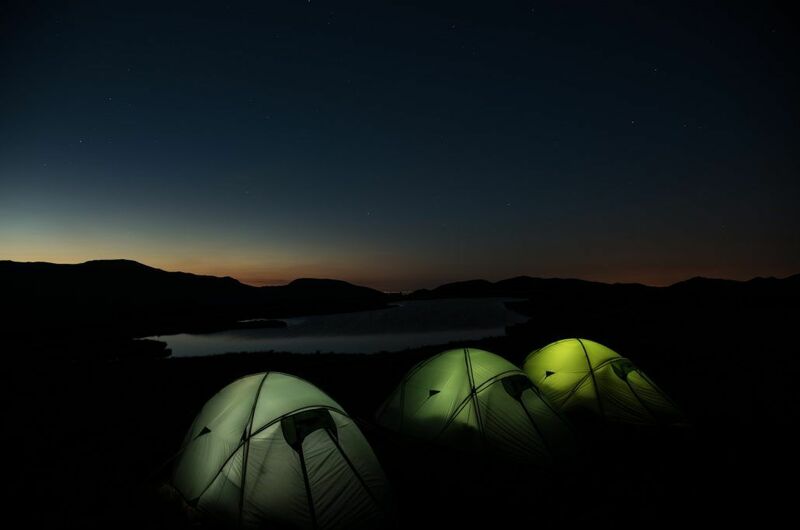 Alex had chosen Terra Nova Ultra Quasar tents, Rab sleeping bags and Theramrest Neoair XTherm mats. Kit allocated, we duly set off just after midday; it was surprisingly quiet. Perhaps we were missing the crowds because many had started early and we’re already summiting or returning, or perhaps people were just avoiding the midday sun. Carrying large packs in temperatures approaching 30 degrees centigrade was relatively challenging, but Alex monitored the pace of the group to ensure that everyone remained happy. A short stop for lunch ensured everyone’s energy levels were sufficient for the climb up to the campsite, Llyn Caseg Fraith, which sits at an altitude of around 750m. Unsurprisingly given the conditions, the walk in was hot and tiring, but the location more than made up for the effort. After a quick respite, we set about making camp. This didn’t take long and Alex then gave his introductory talk, asking each of us what we wanted to get out of the workshop. 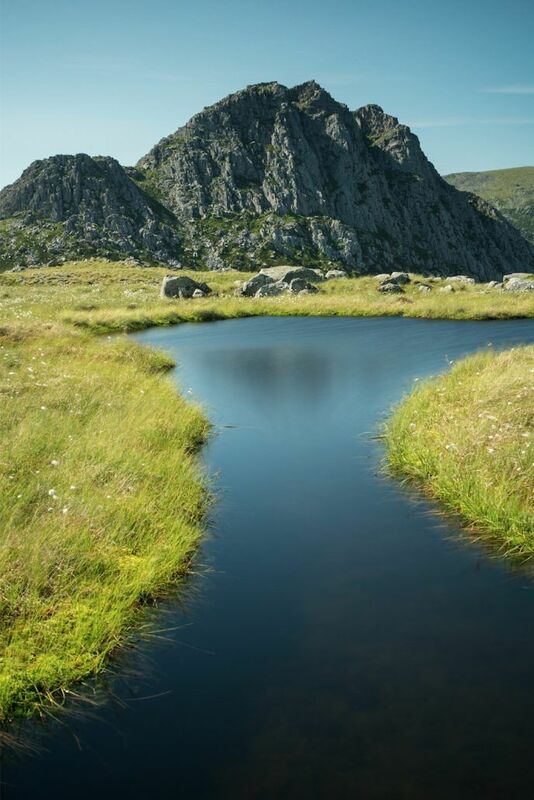 Once this was completed, we started exploring the shores around Llyn Caseg Fraith, composing shots with the peak of Tryfan looming in the background. The bright conditions and the harsh sunlight made me feel very pleased that I’d packed my circular polariser, which is something Alex recommends. 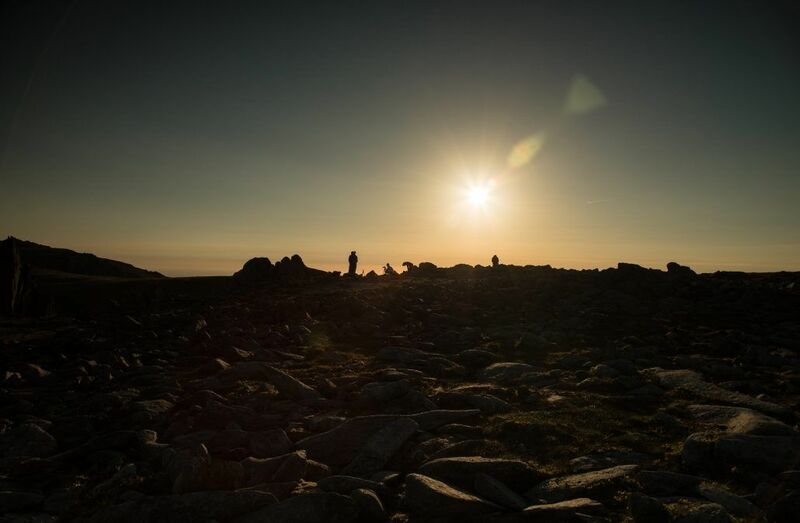 Once we’d finished exploring the area immediately around the campsite, we prepared to climb up further to Glyder Fach for sunset. Alex packed the stove and we each grabbed out dehydrated meal and set off up the slope. 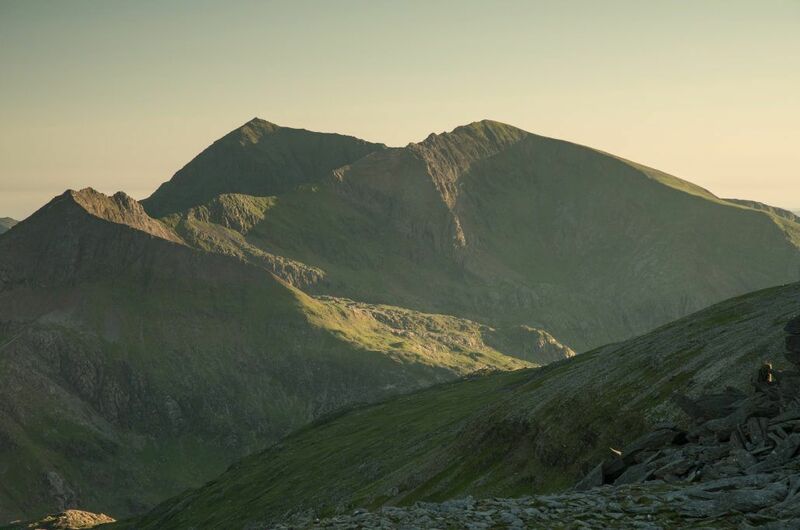 Once on the summit, dinner was quickly eaten and our attention turned to capturing the light on the surrounding mountains, which had taken a on a lovely soft quality as the sun descended towards the horizon. 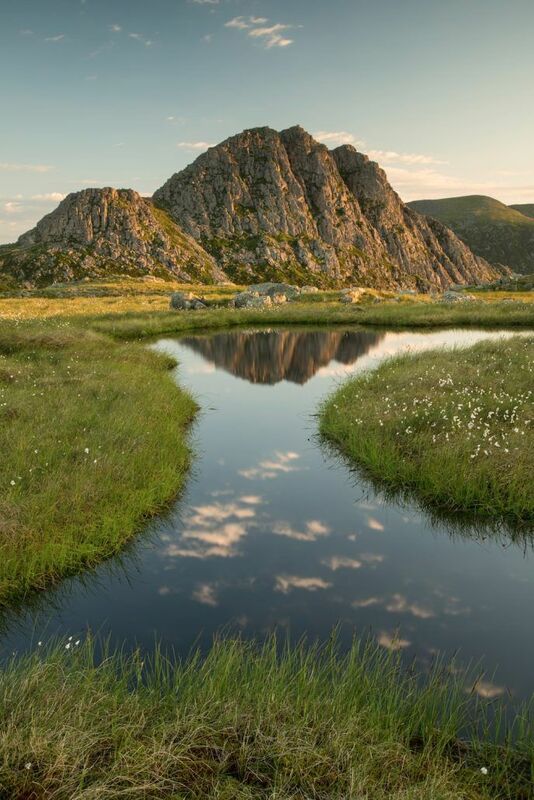 Whilst the rest of the group focussed their attention on the spiky top of Castell y Gwynt, I decided to shoot a time-lapse down the flat-bottomed, glacial valley of Nant Frrancon, which was catching the sublime evening light. Shooting a time-lapse allowed me some much needed time to relax following the early start, long drive and hot climb. I calculated the end of the time-lapse to coincide with sunset, and as the others had finished, we headed back to camp. In the twilight, we illuminated the inside of the tents to allow us to take the quintessential wild camp shot of the tents at night. Following this, we retired to bed around midnight. 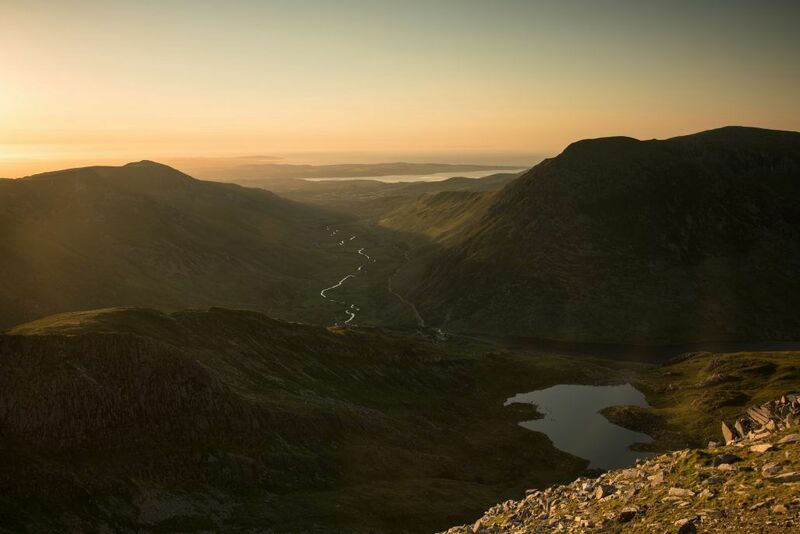 Alex set the alarm for 4am to give us time to get set up for the side light just after sunrise illuminating Tryfan. If anything, my sleep was too comfortable, as I was in a very deep sleep as Alex tried to rouse us early the following morning. It was immediately obvious that the effort required to drag myself out of the tent was more than worth it. A cloudless sky meant that the sunlight should be uninterrupted through to the mountain in front of us. Accordingly, we all scrambled to set up at the compositions we’d scoped out the previous afternoon. The others decided to get a bit more shut-eye, but I was so enchanted by the place I decided to forego this to spend a but more time exploring. As I was wandering around some of the crags nearby, I spotted a comfy looking ledge facing the sun, so grabbed half an hour’s sleep in this enchanting place. I returned to camp just as the others were waking, and we set about eating a leisurely breakfast and breaking down camp. The temperature was starting to climb quickly now, which galvanised everyone into applying liberal amounts of suncream! Once everything had been packed away, there was absolutely no trace that we’d been there. We decided to summit Tryfan before heading back to the car. Given the temperatures and likely crowds on the summit, it was an easy choice to look to stash the heavy, bulky packs somewhere out of the way, before collecting on the descent. We headed off towards the base of Tryfan and found a suitably obliging spot in the shadow of Far South Peak. The ascent was relatively simple, with some simple “scrambling” required to pick a way between the rocks. As expected, the summit was very busy and this, coupled with the flat, harsh midday light precluded any decent photo opportunities. Instead, iPhoned were used to capture the obligatory shots of jumping between the Adam and Eve rocks. A quick (and hot!) yomp back to the car followed, and we were all on our way by half past three. All in all, this was a very enjoyable, reasonable and well organised sojourn into the mountains. It has whetted my appetite for more adventures – I’d best get planning! Alex runs various wild camping and photography workshops, including longer trips to Scotland and Iceland – details can be found at http://www.alexnail.com/workshops/.